Techniques for detecting and quantifying anaerobic transformations of benzene, toluene, ethylbenzene, and xylene (BTEX) are needed to assess the feasibility of using in situ bioremediation to treat BTEX-contaminated groundwater aquifers. Deuterated surrogates of toluene (toluene-d8) and xylene (o-xylene-d10) were injected into BTEX-contaminated aquifers during single-well push-pull tests to monitor for the in situ formation of deuterated benzylsuccinic acid (BSA-d8) and o-methyl-BSA-d10. Test solutions (250 L) containing toluene-d8 (4 - 22 M) and o-xylene-d10 (4 - 9 M) along with a conservative bromide tracer (1.3 mM) and nitrate (4 mM) as an electron acceptor were injected into four wells at two sites (Figure 1). Detection of BSA-d8 and o-methyl-BSA-d10 in groundwater samples collected from the same wells following injection unequivocally demonstrated anaerobic in situ toluene-d8 and o-xylene-d10 transformation with calculated zero-order formation rates ranging from 1.0 to 7.4 nM/day (Figure 2). Concurrent utilization of co-injected nitrate was rapid in all tests at both sites, with zero-order rates ranging from 13 to 39 M/hr. The field tests conducted in this study represent the first reported use of deuterated aromatic hydrocarbons to detect and quantify anaerobic BTEX transformation product formation in the subsurface. Figure 1. 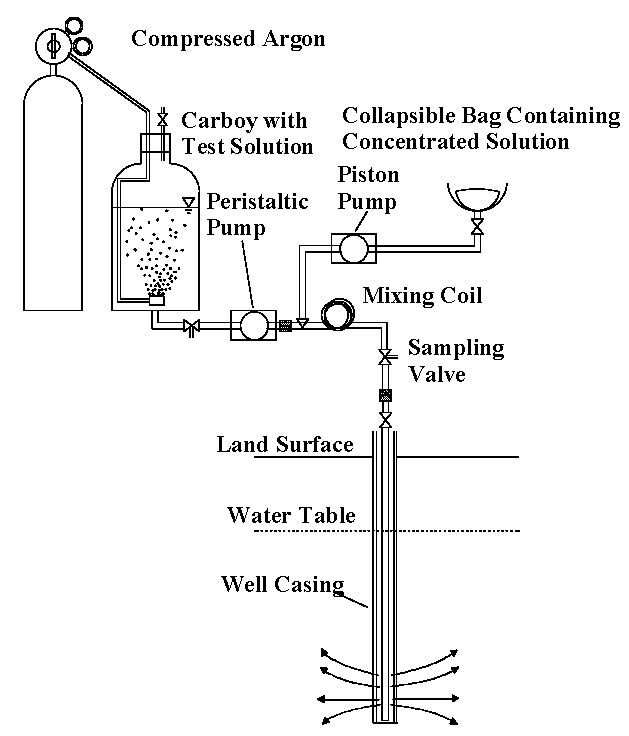 Schematic of equipment used in single-well push-pull field tests. Figure 2. Extraction phase breakthrough curve (a) for test in well CR15 at the Northwest Terminal site indicating dilution of injected toluene-d8 and o-xylene-d10 and (b) utilization of injected nitrate and concurrent formation of BSA-d8 and o-methyl-BSA-d10.